Erik Satie (1866-1925) was a quirky, innovative and enigmatic composer whose impact has spread far beyond the musical world. As an artist active in several spheres - from cabaret to religion, from calligraphy to poetry and playwriting - and collaborator with some of the leading avant-garde figures of the day, including Cocteau, Picasso, Diaghilev and René Clair, he was one of few genuinely cross-disciplinary composers. His artistic activity, during a tumultuous time in the Parisian art world, situates him in an especially exciting period, and his friendships with Debussy, Stravinsky and others place him at the centre of French musical life. He was a unique figure whose art is immediately recognisable, whatever the medium he employed. 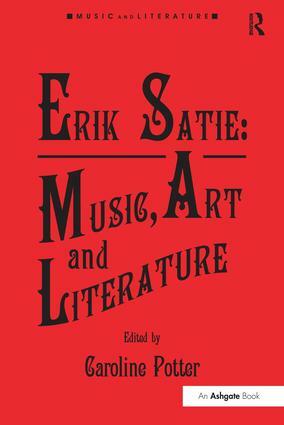 Erik Satie: Music, Art and Literature explores many aspects of Satie's creativity to give a full picture of this most multifaceted of composers. The focus is on Satie's philosophy and psychology revealed through his music; Satie's interest in and participation in artistic media other than music, and Satie's collaborations with other artists. This book is therefore essential reading for anyone interested in the French musical and cultural scene of the late nineteenth and early twentieth century. Caroline Potter is Reader in Music at Kingston University, London. A graduate in both French and music, she obtained a PhD at Liverpool University in 1995 for her thesis on the music of Henri Dutilleux and has published widely on French music since Debussy.